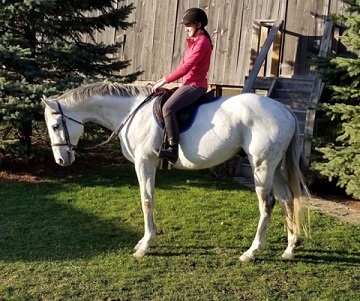 Lightning is a gorgeous grey thoroughbred gelding, 7 years old and 16.1` hh. He has been retired from the track 2 years and retired sound and healthy. He has had lots of down time and recently restarted into work. He will wtc and do small jumps, trail rides. He is suited for hunter jumper or eventing and for a confident experienced rider to bring out his potential. Videos available.